I’d like to thank you for last night for the School Ball Hummer Limousine as the kids were really happy with your services! The black hummer hire perth was amazing and we took some beautiful photos. It was a welcome relief to know the kids would be brought home to us at midnight from the ball rather than us parents going in to pick them up. Thanks again for making it enjoyable for them! 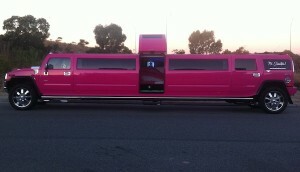 Just wanting to drop you a line to say thankyou for the wonderful Pink Hummer Limo Hire Perth for my daughters 13th birthday party yesterday. The girls had a fabulous time. There was lots of laughter, giggles and lots of LOUD music. Angela had been asking for more than a year for a Pink Limo for your birthday party and it was every bit as wonderful as she had hoped. I must also mention how lovely your chauffeur Mike was. He made the ride very enjoyable. Once again Thank you ! Thank You very much for my Amazing 16th Birthday Party on Saturday night. The karaoke was so funny, I never knew my voice sounded like that. We all had a Blast, Bit tone Deaf and a Few Sore heads but it was Amazing. Loved the White Hummer limo, especially the middle Jet Door. My Aunty and Uncle even had heaps of fun. It Was a Fantastic Night!!! My Best Party Ever!!!!! Hi Showtime Limos Perth team! 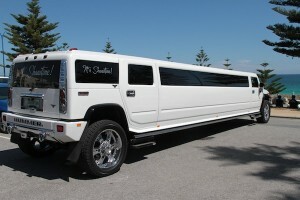 Just wanted to thank you so much for the brilliant Pink Hummer Limo hire Perth service we had from Hillarys on Friday night. As it was my 50th birthday I went all out and had the time of my life. 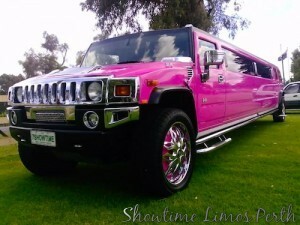 Pink Hummer Limo Hire Perth 50th Birthday Party Blast. The girls had not had so much fun since we left high school. Special thanks to Sue our chauffeur for her fantastic service and great sense of humour. Just a quick note to say thank you for your limo service for my daughter and her friends at the Woodvale Secondary College Ball that was held last month on the 20th April. I thought I would take the time and provide you with some feedback. Apparently the driver, Roger was very friendly and made the journey a lot of fun. I know her and her group of friends appreciated it. Also, the limo arrived on time at the pre-ball which was also appreciated.